I remember the first time I heard of the Ice Cap (also called the South Patagonian Ice Field or the Continental Ice Cap), many years ago now as I was just getting into the mountain scene. I was flicking through a Macpac outdoor gear catalog from NZ and they had a full double-page photo of their expedition tent, the Olympus, illuminated at dusk on the Ice Cap, surrounded by craggy peaks and an endless tract of ice. The photo alone was enough for me to go out and buy the tent (at enormous expense I recall – I was still a uni student), and I had a burning desire to go and experience the Ice Cap for myself someday. I was back in Switzerland earlier this year and found out that my Irish mate Mark McCarthy, with whom I used to work at ALSTOM, was also planning a trip down to Argentina around Christmas. We swapped notes and it seemed like we were on the same page, so we decided to head to Patagonia together. We started to formulate our plan: a circuit around the FitzRoy massif including a short traverse of the Ice Cap (Campo de Hielo Sur in Spanish) past the western side of famous Cerro Torre and Campo de los Altares. Mark had already been in Buenos Aires a couple of days by the time I flew back in from San Francisco, and we had one night to get all our gear organized (and believe me there was a lot of it!) before we flew to El Calafate the next morning, not quite as far as Ushuaia but just about as far south as you can fly. A boozy farewell on our final night in civilization ensured that we were both feeling a little rough as we stepped off the plane and into a very cold and windy Patagonia. We raced around El Calafate to grab all the last bits and pieces we needed to head up into the mountains – all our food, fuel for the stove etc. – and were able to grab the early evening bus that took us four hours north to El Chalten. (L) At El Calafate airport. (R) Food shopping – with backpacks. Weather-wise we expected the worst. We’d heard nightmare stories about Patagonian weather (in the summer) and were prepared to not see a thing through the cloud, be rained and snowed upon every day, and be blown clean off our feet by the incessant wind. Already after half a day at close to 50 degrees south we’d quickly learnt how the “Roaring Forties” and “Furious Fifties” got their name – and both of us have a renewed respect for any sailor that rounds Cape Horn! But the weather gods were kind to us that day, and driving towards El Chalten we were blessed with clear views of Mt Fitz Roy, Cerro Torre and the rest of the Fitz Roy range at sunset. It was a beautiful view and we went crazy with photos, thinking this might be the only thing we see for the next week or so. Beautiful Fitz Roy, with Cerro Torre to the left. The Ice Cap lies behind the mountain range. Sunset en route to El Chalten. We arrived late in the evening in El Chalten, a town that has sprouted up in the past few years as the tourist dollars have started flowing in. It’s a cute little village without a sealed road or a set fo traffic lights, and it had a bit of an alpine/frontier feel to it. Our bus dropped us off at one of the larger hostels in town and we were lucky to get a double room for the night. We did a last sort-out of our gear and had an early night, knowing we probably had a big day ahead. We woke up early and made a bee-line for the National Park office. We wanted to notify them of our trip plans and find out a little more about the route we planned to take. They turned out to be next to useless for information (weather forecasts, trail info., camp sites etc. ), but we were able to work out that, due to the prevailing wind from the north-west, we were best to do the Vuelta circuit anti-clockwise (instead of the original direction we researched), which would give us the wind to our backs on the Ice Cap. That change meant that we had a much easier and shorter walk in on the first day from our drop-off point up the valley to a small refugio. Now not pushed for time, we went and had a final slap-up meal in town after we’d been to the police station to get our permits that would allow us to leave and re-enter Argentina – our route took us across the international border along the Ice Cap and into Chile. Registering at the National Park office. After a good final feed we got a taxi to drive us some 20 minutes north to the trailhead. We then had a cruisy three hour hike up the valley to the refugio. The weather was pretty miserable (light showers and lots of wind) but we made good time there. Rather than pull out the tent and get it wet on day one, we took bunk beds at the refugio, and rather than start working through our food rations, we ate a huge meal prepared by the refugio. (L) At the trailhead. (R) Looking up the valley at what’s to come. (L) Arriving at Piedra del Fraile. (R) Our gigantic and delicious last supper of lamb with carrots! The next morning it was still blowing a gale and still raining, but a glance up the valley revealed the chance of some better weather up that way. 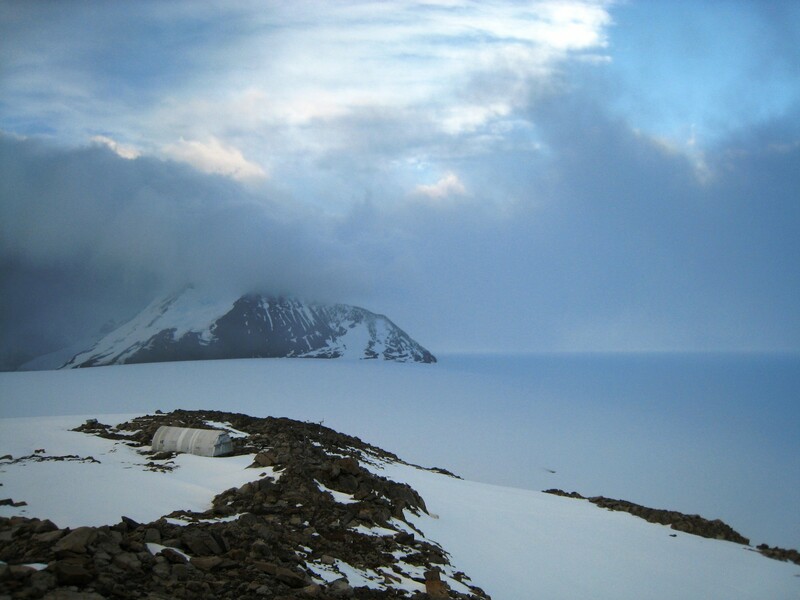 We could see a part of the glacier we would be ascending, and the clouds seemed to lift around corner at the edge of the Ice Cap, so we decided to give it a shot, knowing that there was a camp site we could stay at if need be by the lake. After the first hour, which was an incredibly hard slog upwind into driving rain, we arrived beside the lake. Some incredibly poor route markers meant we ended up off the track and we wasted quite a bit of time scrambling over rocks. We eventually found the path again and followed it along the lake, over loose boulders and up into the glacial valley. (L) Now that’s a head-wind! (R) Surf’s up at Lago Electrico. Off route and tough going across the grain, through loose vegetation and into a wind strong enough to knock us off our feet. (L) Uh oh, don’t get the boots wet! (R) Time for a hot brew. (L) Feeling the weight of the pack. (R) Nearing the face of the glacier. After some three or four hours more we finally arrived at the moraine at the edge of the glacier, and took some time to gear up. We took every precaution as we didn’t know what the conditions would be like on the glacier: we used crampons and ice axes, roped up, and both of us had ice screws handy to use if one of us did fell down a crevasse. As it turned out the glacier was bare with no snow covering it – this is “safer” as you can generally see the crevasses – and so the going was pretty good. It took some time to find a safe route across the first glacier that avoided the heavily crevassed areas and we made pretty good time on the ascent. We stuck to the left-hand side of the glacier, avoiding the largest, most obvious crevasses. We climbed onto the second glacier and had a much-needed break sheltered out of the wind behind a small pile of boulders. We’d been going for a good seven hours and knew we had a lot more ahead so we took the chance to eat some much-needed food. In the wind – you have no idea how strong it was!! – there was no chance of lighting the stove so we opted for dried apricots, chocolate and nougat. We knew the steeper and more technical section was still to come and we could see the route up the glacier ahead. (L) The route ahead, up and to the right. (R) The final ascent up onto the Ice Cap. Mark powers up Marconi Glacier as the weather starts to close in (again). We approached the final, steepest section of the climb, a mixed snow/ice ascent up the right-hand edge of the glacier with a dodgy looking cluster of overhanging seracs to the left-hand side (that we duly avoided). On the icy lower section we remained unroped and climbed at our own pace, pausing when the wind gusts were at their strongest – they roared down the glacier and brought stinging snow drifts with them that forced us to turn our faces away. When the ice turned to snow cover we decided to rope up, as we were concerned about hidden crevasses. (L) Roping up. (R) Looking back down the valley. A tough slog! Steep ice with a loose covering of grainy snow – not the most solid footing. After 12+ hours of climbing both Mark and I were exhausted. We knew we had passed the steepest section, but we couldn’t judge the remaining distance we had to cover and the time to cover it, the light started fading and the storm didn’t look like abating. We made the decision to move off to the side of the glacier, find a sheltered spot and set up camp. After searching for ~30 minutes we both realized that we couldn’t find anywhere sheltered from the wind in the inhospitable landscape we were surrounded by, and eventually settled on a small patch of snow behind a number of boulders. As darkness fell we dug out a snow platform and set up the tent in a roaring wind. I put on a brew and we hunkered down for the night. (L) Camp 1, with collapsed cornice. (R) Drying out after a wild, stormy night. The storm had calmed a little by morning, and we were quick to get going and finish our ascent before the window closed. We packed up camp, roped up, and worked back onto our route up the glacier. Within an hour however, Mark wasn’t feeling 100% and wasn’t climbing strongly. After we spoke I had to respect the fact that my climbing partner wasn’t feeling quite confident about the day ahead, so we turned around and descended part of the glacier to set up camp behind some smooth bedrock. The rest of the day was spent going crazy in the tent while the storm picked up again. (L) Camp 2 – we didn’t get far. (R) Sitting out the storms = boring! By next morning neither of us were feeling confident that the conditions would improve. Mark wanted to descend the mountain but I was able to sweet talk him into remaining where we were for the day, to see if the weather would clear (my MBA colleagues will be pleased to hear I even employed a decision tree as a persuasive tool!). With only a few hours of daylight remaining I styuck my head out of the tent and felt that the clouds were lifting and the winds dying down. Mark was extremely dubious but gave me the benefit of the doubt. We packed in a hurry and started ascending once again. After an hour we were making good progress and were incredibly surprised to see another climbing team descending the glacier – the first people we’d seen in days! We stopped to swap notes with what turned out to be an Argentinian team and learnt that they’d been stuck up on the ice cap because of the storm as well, and were using the weather window to descend. Seeing the other team boosted our confidence immensely, and we continued our ascent as the gradient leveled off. As we climbed the weather kept improving, and before long we had sun and blue sky (although the wind was still incessant). After an hour of walking we finally spotted the Patagonian Ice Cap to the west, and we were both elated! Woohoo! We get our first view of the Ice Cap. (L) Mark checks our GPS bearing against the compass. (R) Looking back at the way we came. (L) Knackered, but elated! (R) Mark can’t believe his luck. What a sight! Fitz Roy Massif to the left, the Patagonian Ice Cap to the right. Home Sweet Home for a night: El Refugio Chileno, at the edge of the Ice Cap. A German expedition heads south onto the Ice Cap towards Los Altares. (L) My Mawson shot. (R) Da fellas. Outside the refugio, preparing for the descent. Tough going across the ice on some really crusty snow… and 30kgs on your back doesn’t exactly help! But what a view!!! Mark during the descent – looking every part the Antarctic explorer – with our first glimpse of Fitz Roy in the distance. Clearer weather on the descent. ← Me encanta Buenos Aires! I´ve noticed that you have lived in Argentina. I was born in Argentina, in Buenos Aires and then I moved to Córdoba. I´ve lived there till 2005 when I moved to Spain. What a surprise!!! What a trip,i have a cerro torre back pack,lowe and a 2004 macpac olympus tent. How did your tent perform up there,and what year did you buy your tent?. Thanks for sharing it on the net. I probably bought the Macpac Olympus tent back in around 2004. It was actually a photo in the Macpac catalogue back in the day of an Olympus tent on the Patagonian Ice Cap that inspired me both to buy the tent and one day get up onto the Ice Cap. The tent performed well up there. It took a battering in the wind, but like all tunnel tents it did really well when lined up with the prevailing winds. I lost a few guy lines but that was due to the sharp rocks on the glacier that we used to help anchor the tent down. It was a great trip, I’d love to go back and do some more down there!